The history of the village of Izmaylovo goes back to 1389. Since the days of Ivan the Terrible it was an estate of boyars in the Romanov family. In 1654, it was inherited by Alexis of Russia, who built an château on an artificial island around 1664—1690. At about the same time, in 1671—1679, a medieval church was rebuilt into Church of Intercession of the Most Holy Theotokos. 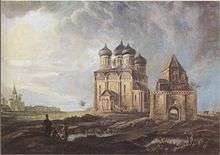 The château was later expanded by architects Konstantin Thon and Mikhail Bykovsky into Izmaylovo Estate. It survived the fire of 1812, and is now an outdoor tourist destination. According to the Russian population audit of 1800, the population of Izmaylovo was 121 homesteads comprising 753 people. The village continued to grow slowly until the October Revolution, when the buildings were confiscated and given to laborers. 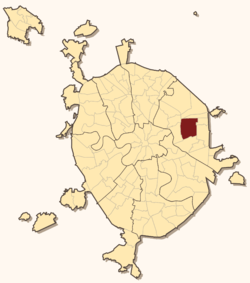 In 1924, a part of Izmaylovo became known as Bauman township, named after the Russian revolutionary Nikolay Bauman. This name is still retained in the Baumanskaya metro station and Bauman University, both located in Izmaylovo. 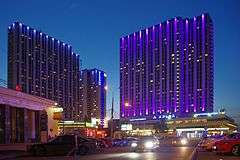 Izmailovo Hotel is the largest hotel in the world. It was built in 1979 and can accommodate over 7,500 guests. It is also situated in Izmaylovo District nearly Partizanskaya station of Moscow Metro.